Ribbons made from silk and satin are so inviting with their gentle patina or glowing sheen. If you love textiles like I do, I'm sure you understand the draw to admire, touch, and create. Making flowers and trims out of ribbon isn't something I have attempted, but I do admire those who have the patience and skill to create with such beautiful materials. 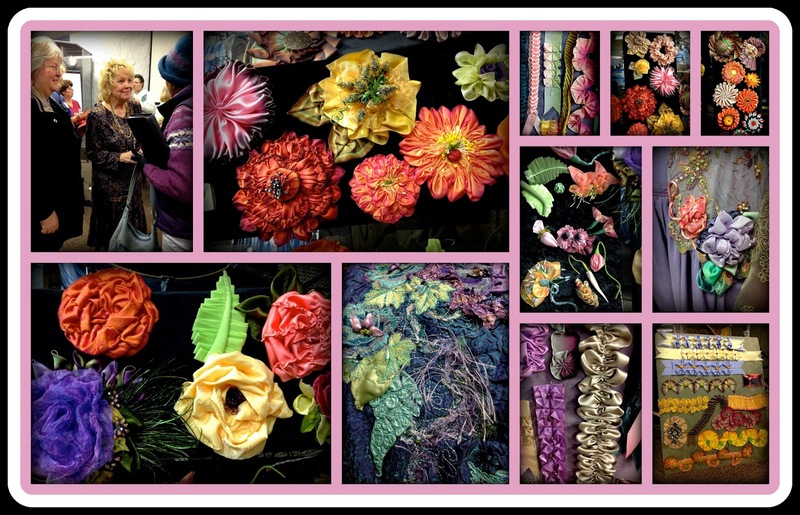 There are images galore of flowers made from ribbon in Google. 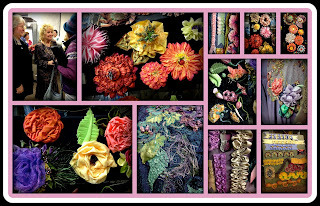 And here's a Pinterest board of ribbon and fabric flower ideas. But none are nicer than the ribbon flowers and trims made by Deb, a woman who recently spoke to the local quilt guild. It was a chilly winter evening and the meeting room was filled with women who arrived wearing hats, coats, and gloves. We were met by a beautiful display of colorful hats, gowns, and ribbon boards designed and fashioned by Deb. They were exquisite! Such patience and such ability she has! Have you made ribbon roses or other flowers before? My mother did some ribbon embroidery (a similar art) and was skilled at making ribbon flowers. Her favorites were always pansy's which she used to adorn baskets, candles, pillows, and more. Click on the photo montage to enlarge and get a better look. I have made ribbon roses from wire ribbon and it actually is quite easy. I know you could do it. Oh ribbonry has been passion of mine for awhile. I recreated Texas wild flowers from ribbons to decorate one hat. Collecting vintage ribbons is fun!